Protect the Peaks! - Protest Destruction of the Peaks! Stop Snowbowl! Idle No More! Protest Destruction of the Peaks! Stop Snowbowl! Idle No More! Fri. Feb 1st – March through Downtown. Meet/converge at 6:30pm at Wheeler Park. *Look for banners, dress warm, and bring a camera if you can. being there to insure that we honor 500 years of resistance! We have NEVER been idle. allowed by a court ruling to develop a ski area on 777 acres of the Peaks. of thousands of old-growth trees crashing into the torn earth. So we hiked at dawn and chained ourselves to stop their violent machines. protection of the endangered San Francisco Peaks Groundsel, and protection for all those who know their sacred links with these mountains. but we still can and will stop snowmaking. 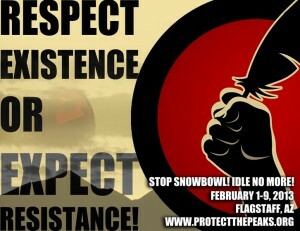 oppose, & confront Snowbowl to join us in the spirit of Idle No More. We respect diversity of tactics and encourage affinity based organizing. below or at any other locations. Our action is our prayer. When Mother Earth is Under Attack, What do we do? Home Event Protest Destruction of the Peaks! 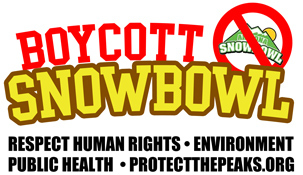 Stop Snowbowl! Idle No More!